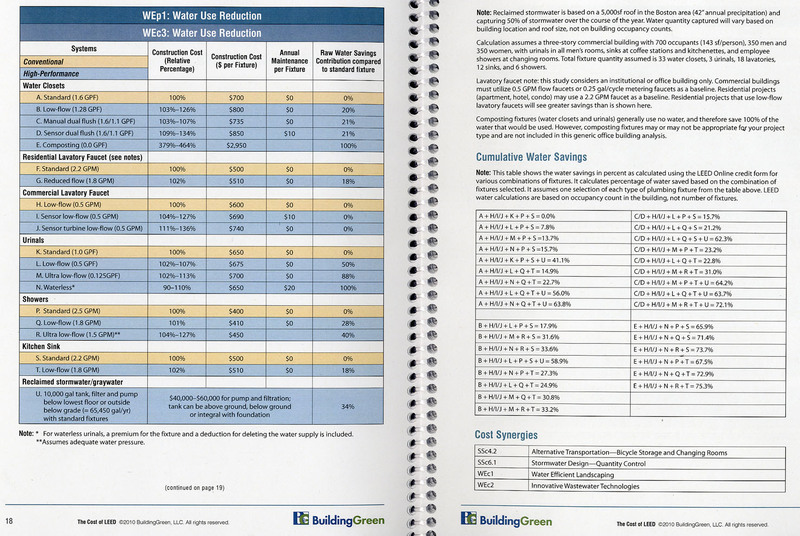 A few weeks ago I was provided with a copy of The Cost of LEED whitepaper ($49 + shipping) from BuildingGreen*, and I must say I'm impressed. The report is by no means flawless, but it's the first one I've seen that provides designers with a credit-by-credit 'back of napkin' figures to use to calculate cost premiums for various design strategies. This profile of credit WEc3, Water Use Reduction is fairly typical... setting 'conventional' systems as the cost baseline and indicating specific premiums for various upgrades that may be used when pursuing the LEED points. It's important to point out that this is probably one of the longest credit reports in the whitepaper, as more than a few strategies (e.g. SSc1, Site Selection or SSc4.1) are so dependent on local site factors as to be unquantifiable in any realistic sense. Assumptions are pointed out when appropriate and in general I feel like you're provided with enough information to make adjustments on the fly if you have strange circumstances. The report only covers the LEED-NC v3 rating system, so if you're pursuing anything other than LEED-NC or LEED-CS this report will be of limited value. I see two major problems with this whitepaper. The first and most significant is that soft costs of LEED (energy modeling, documentation fees and the like) are not provided. I think the soft costs component of LEED premiums have not been discussed sufficiently as an industry, and from my limited experience I've found fees still vary significantly from consultant to consultant. I would have greatly appreciated a section that attempted to provide some ground rules for costs from civil engineers, MEP engineers, architects, contractors, specialty LEED consultants, etc. It's worth noting that commissioning costs are the exception to this rule and are included in the report. It's also worth noting that the GSA study takes a stab at soft costs (see page 6), though it lumps all parties into a single figure that isn't terribly useful. The second lies in the accuracy of the specific costs listed for each specific measure, and I could be off base about this. Not being a cost estimator myself, I've taken informal polls from a few people in design and engineering fields locally, and the consistent response is that the costs 'seem high'. I think this is likely due to the fact that "cost data is based on northeastern US construction costs from 2008." I'm in South Carolina, and it only stands to reason that everything would be cheaper here, but that doesn't change the fact that those costs would likely need to be adjusted across regions and time. In their defense, these issues are presented right up-front in the Assumptions and Qualifications section. Ultimately the strength of this report lies in the "Construction Cost - Relative Percentage" tabs for every credit. The simple multipliers allow you to consider the impact of adding credits early in the design phase, and the Cost Synergies section helps ensure you're not making those decisions in such isolation as to not understand the impact on other points you may be considering. It allows you to have an answer, however rough, when a client asks you a question like, "How much would it cost if we decided to switch from our dark roof to a light TPO membrane?" The use of concise charts allow you to do this in a report that is only 47 pages, yet at the same time it includes at least one strategy I haven't even heard of (e.g. aircuity systems). *FULL DISCLOSURE: BuildingGreen operates LEEDuser.com, a sponsor of this site. The copy of the Cost of LEED report was provided free of charge for review purposes. That said, I stand by the review I've posted as an accurate and un-biased portrayal of the report's value, and I would make the same report even if LEEDuser were not a sponsor of this site. If you feel I've overlooked or omitted anything important please speak up by leaving a comment! Joel, thanks for your fair review of the report. For any of your readers interested in buying the report, I want to note that it is also available as a downloadable PDF through the LEEDuser website, also for $49. I am writing from SustainbleCitiesCollective.com, we are interested in working with you. Could you please email me at caitlin@socialmediatoday.com so I can send you further information?